Is this the same thing as "Bloat"? What is Gastric Dilatation-Volvulus (GDV)? Why is GDV so dangerous? What are the causes of GDV? Is my dog going survive surgery? What is the quality of life if my pet survives? What can be done to prevent GDV? My dog is young and healthy; should I consider a surgery to prevent GDV? Although this condition is commonly referred to as "bloat" by many veterinarians, technicians, and pet owners, it is MUCH WORSE. Bloat is simple gastric distension (swelling of the stomach, often with air, but sometimes with food or fluid), it can be resolved with more conservative therapy such as passing a stomach tube and emptying the stomach; very mild cases can do well with gas medications, such as Gas-X. That being said, however, if someone tells you your dog has "bloat," they are probably referring to GDV. It's a slang term, and as a result it can be confusing. Some people will also call it a Torsion. If it's not clear, ask if your pet has GDV; or ask if the stomach is twisted. If so, your pet has GDV and needs emergency surgery, or he or she could die within just a couple hours. However, patients having an incidence of bloat are at an extremely high risk for Gastric Dilation-Volvulus (GDV). As a result, I strongly recommend a prophylactic (preventive) gastropexy (stitching the stomach to the body wall) to prevent a life-threatening GDV from occurring in the future. This term is used almost synonymously with Gastric Dilation-Volvulus.Technically, a torsion is a twist about the long axis, like if you simply rotated a hose in the opposite direction in each hand, twisting it and kinking it off. A volvulus is where a looped structure twists about the based of the loop. If someone is talking about a twisted stomach, or a Gastric Torsion, they are talking about GDV. It IS important to distinguish GDV from Mesenteric Torsion (which is twisting off of the entire blood supply of the small intestine), though both are surgical emergencies. Rotation of the stomach (Volvulus) is the difference between a true bloat and a GDV. The stomach rotates as a loop (usually in a clockwise fashion), such that the esophagus and duodenum (first part of the small intestine) are kinked against each other. The rotation kinks off the entrance to and the exit from the stomach, preventing any expulsion of air (which continues to accumulate as food is digested), fluids, etc. 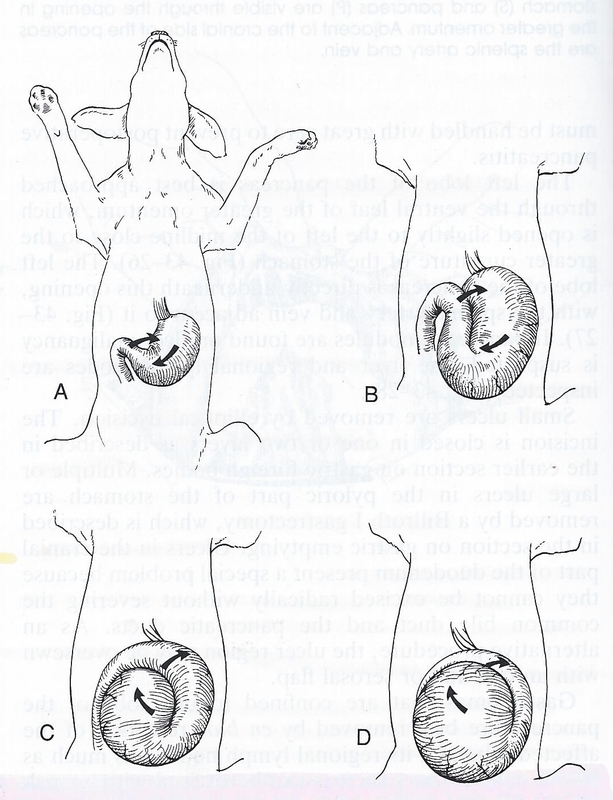 Image from Douglas Slatter's Textbook of Small Animal Surgery, Second Edition. GDV is a rapidly progressive condition that can be fatal and/or cause devastating tissue damage within just a couple hours. It is one of the few true emergencies in veterinary medicine. The distended stomach compresses the vena cava, preventing blood from returning from the back half of the body to the heart from the abdomen, and eventually compromises the aorta, decreasing blood supply from the heart to the back half of the body. As the stomach's blood supply is compromised, the lining of the stomach dies and sloughs off. The remaining layers of the stomach will soon follow. Pressure on the diaphragm makes it very difficult for the pet to expand the lungs and distribute oxygen. Stretching and distension of the stomach can compromise the blood supply to the spleen, via pressure/occlusion, thrombosis/obstruction, or tearing (hemorrhage from which further compromises the pet). Decreased blood supply to the brain, liver, kidneys, etc., can result in Multiple Organ Dysfunction. The exact cause of GDV is not completely clear, and it may differ from pet to pet. The stomach may bloat first, and then the volvulus (twist) may occur; or twist may occur first, and then the gas distension may follow; some patients even have intermittent volvulus (and intermittent clinical signs) without distension, but these very often progress to GDV. History of bloating or volvulus warrants a prophylactic (preventive) gastropexy (stitching the stomach to the body wall) to prevent a life-threatening GDV from occurring in the future. 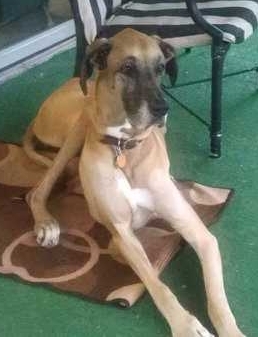 Great Danes are at the top of the list. Also very common: Rottweilers, Standard Poodles, Labrador, Golden, and other Retrievers, German Shepherds, and similar breeds, etc. I have seen GDV in a miniature dachsund, and even a cat! Interference with breathing and blood supply leads to hypovolemic shock, due to low blood supply and poor oxygen delivery. Depending on the severity of the distension and twisting, life-threatening complications can occur within hours. Smooth or Complicated recovery for your pet. If your pet is showing any of the above signs, contact your veterinarian. Abdominal x-rays, especially the right lateral view, almost always makes the diagnosis. In this view, the distended and abnormally positioned stomach has this typical "Popeye arm" appearance (it is said to look the a muscular arm flexing). Image courtesy of the ACVS page on GDV, and supplied by Gregory S. Marsolais, DVM, MS, Diplomate ACVS. 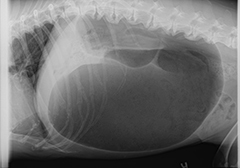 Chest x-rays are indicated as the disease often occurs in older pets (to rule out additional disease processes). Evaluates kidney and liver values, etc. Evaluates for organ compromise caused by the lack of tissue blood flow. Blood glucose evaluates for septicemia (systemic infection). Evaluates for anemia due to hemorrhage from splenic or spenic vessel rupture. Tests for evidence of DIC (Disseminated Intravascular Coagulation), a disease causing spontaneous hemorrhage and/or unwanted clotting/thrombosis caused by inflammation, vascular compromise, or other systemic disease. Blood Pressure is monitored to determine when the pet is stable for surgery. While the surgery is a true emergency, and the pet should go to surgery as soon as possible, a pet that is anesthetized and de-rotated without receiving sufficient IV fluids and/or blood pressure support is at very high risk for sudden death from vascular collapse. Colloids (large molecule fluids that better maintain blood pressure) vs. hypertonic saline, etc. Surgically creating a permanent adhesion between the stomach and body wall to prevent recurrence of volvulus. Most pets "bounce back" rapidly and do well. However, based on how long and how severely your pet was compromised, your pet may have issues with blood pressure, oxygenation, anemia, clotting abnormalities (spontaneously bleeding or clotting, which could be life-threatening), pneumonia, and other issues. The greatest risk of problems is within the first 24 hours, but complications can occur even 5 days out. Once a pet recovers (even following partial gastric resection), however, he or she can generally return to a normal life. If stomach is resected, it may take a period of weeks for the stomach to return to normal size; but, your pet generally can solidly recover. Studies contradict each other in whether pets should be fed elevated meals or not, large or small kibble food, and/or rested or walked after meals, etc. There is little to no morbidity (negative clinical side effects) associated with prophylactic/preventive gastropexy. GDV is consistently associated with the potential for life-threatening complications. In breeds at high risk, such as Great Danes, sight hounds, Malamutes, Mastiffs, German Shepherds, retrievers, etc., I strongly recommend considering a less-invasive prophylactic/preventive gastropexy at the time of neutering (spaying/ovariohysterectomy or castration). Any time the abdomen is entered for another reason in a breed at relative risk -- generally medium to large breed dogs, though small breeds sometimes suffer this condition -- I strongly recommend surgically performing a prophylactic/preventive gastropexy. If your pet is showing signs discussed above, IMMEDIATELY contact your veterinarian -- They can contact Dr. Christiansen for emergency surgery if needed.